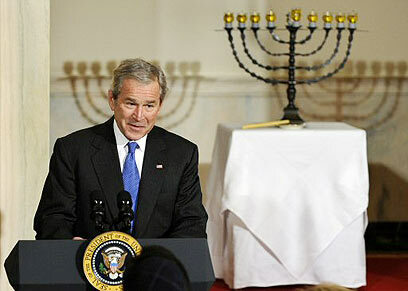 WASHINGTON – US President George W. Bush recognized Hanukkah on Monday night, at a White House reception held in the presence of some 600 guests. Lighting the menorah's first candle were Prof. Yariv Ben-Eliezer, the grandson of Israel's first prime minister, David Ben Gurion, and Clifton Truman Daniel, the grandson of Harry Truman, the 33rd president of the United States. Truman who was the first head of State to recognize the State of Israel after its induction by the UN. The Menorah used in the ceremony was the one given by Ben Gurion to Truman, during his 1951 visit to Washington. After the lighting, Kol Zimra, an a cappella Jewish choir, performed a medley of traditional Hanukkah songs. Bush and his wife Laura presided over what is once of the last ceremonies they will hold in the White House, meant to symbolize the strong bond between Israel and the US. The US president recounted the story of Hanukkah and of the Menorah. Speaking of the miraculous victory of a small band of Jewish patriots over the Greek empire, and the oil that burned for eight nights, Bush compared the Maccabee's victory with the founding of Israel, which he called "another miraculous victory." "When President Harry Truman led the world in recognizing Israel in May of 1948, many wondered whether the small nation could possibly survive," Bush said. Israel, he added, has become the light upon the nations and one of the United States' greatest friends. See all talkbacks "Bush lights Hanukkah menorah"